If you want to train and eat like the pro’s, enter to be one of 10 winners who will receive Oberto All Natural Beef Jerky. Oberto’s line of All-Natural Beef Jerky is 100% free of artificial ingredients or preservatives. It is high in protein and does not have any MSG or sodium nitrates! All you get is 100% taste and flavor. You get out what you put in – Oberto’s champaign to encourage you (an active individual) to get the most out of your life, sport, or workout, by eating their All Natural Oberto Beef Jerky. There isn’t any cutting corners or skipping trainings, otherwise you might find yourself sitting on the sidelines, missing out on all the fun. Excellence is not given, it is earned and YOU deserve the best so you can be your best. To show how much Oberto’s is committed to your health and fitness, they are offering $10 off registration for any Tough Mudder event! So purchase a bag of Oberto’s All Natural Beef Jerky and tear into tasty goodness. “Like” Appetite for Health on Facebook. Leave a comment below (not on Facebook) telling us why you should win. Open to all residents of the continental US only please. Entrants will be accepted until midnight EST on December 4, 2014. All AFH Terms and Conditions Apply. I really like beef jerky, but limit my consumption. This sounds so healthy…would really like to try it !!! I have 3 boys that love beef jerky! I should win because I shared this opportunity on Facebook, Tweet and Pinterest. Only share all natural goodness with others as you would only intake yourself. That’s caring…. I signed up for free e newsletter and I like AFH on Facebook . I’ve taken up running in the past couple of years and any extra protein I can get that’s healthy is something I’m indeed thankful for! Jerky is a great high protein snack. and it’s great cause it’s portable! This snack would be ideal for my sons whom I adore, Love this. I’m always looking for a healthy snack..Would love to win…. Would love to win because I love Beef Jerky….Will share with family and friends…. I am trying to diet – to lose about 60 pounds before my wedding in June. Jerky has been really helpful with this, as an alternative to hitting the vending machine, and it keeps me full. I should win because Jerky is healthy and I love it! I’m a loyal Facebook fan and email subscriber! My Dad LOVES Beef Jerky as it’s one of his very favorite treats! I’d definitely gift this to him as it’s a nutritious and healthy source of protein that’s very convenient and portable for his gym trips too! I would like to find a healthy new snack! Beef jerky makes a great snack for long holiday roadtrips. Jerky is a good food for when you are watching your carbs, after the Holidays. I love jerky and it is low in calories. Am on weight watchers and jerky is a great protein snack. I should win because I have two adult sons and a husband who LOVE these. They are a great, healthy alternative to candy at Christmas time! I would love to try something different. Especially when you are trying to keep healthy. I love beef jerky. I recently tried the OBerto Bacon Jerky. Delicious! Would love to win this & save a little money on my jerky addiction. My whole family enjoys snacking on beef jerky and this sounds like a great new treat for all of us to try! I’d share it at our family Christmas potluck too. I’m a Facebook fan and subscriber. Thanks! I’m not much of a meat eater but do love jerky. If I should win, I would be getting a great protein source and of course sharing it. 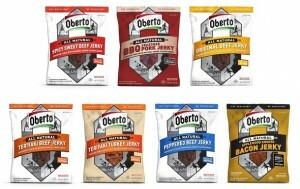 I’d like win some Oberto Natural Jerky so I’m able to choose a healthy snack to eat during the day instead of fast food. I would like to win so that I have some high protein, low fat snacks that do not have any artificial ingredients, or preservatives. I love jerky, and would love to try a healthier version! Because with my husband and 3 sons, I never have enough jerky in the house! I’m a subscriber and I like you on Facebook. Everyone in my family likes Oberto jerky! Because I love healthy beef jerky and it would provide lean mean energy. Would love to win because I love Beef Jerky….It’s a fun snack…. Everyone has a good reason why they should win and I don’t envy you at having to choose. My reasons are resonant of what you have already read. Pre-diabetis, overweight. struggling with menopause weight issues, desire to include more healthy foods. Jerky is our hero! We are a young on-the-go family and need all the portable protein we can get! i like Oberto All-Natural Jerky and need healthy snacks in our home that will give us energy. I should win so that I have delicious jerky to fuel my daily workouts. I try to eat healthy. This would be great before or after a workout. Jerky is a yummy and healthier snack for our whole family…even my two boys love it. We would love to receive this prize pack. My hubby loves beef jerky and these would make a great snack for him! I’m a Facebook fan and subscriber too. I have subscribed to newsletter! I have Liked Appetite For Health! I would love to win because I am trying to eat healthier and this would be the perfect on the go options. I am trying to get my S.O. to eat healthier and he loves jerky….perfect! Jennifer H, Georgiana S, Candace L, Renee R, Lori W, Jay, Shawn T, Howell, John H, Amy C — you’ve won the prize and will be receiving an email with details shortly. Congrats!